It’s normal to feel self-conscious about bald spots and hair thinning, but you’re not alone. More than 35 million men experience hair loss. However, men aren’t the only ones who deal with this condition; more than 21 million women suffer from the condition as well. Women tend to notice thinning around the area where a ponytail is secured, as well as gradual thinning along the hairline of the forehead and central scalp. In both men and women, the incidence of hair loss and thinning increases with age. Luckily there are promising innovative treatments that address and even reverse hair loss and thinning. Cosmetic Laser Dermatology uses the innovative treatment PRP, or Platelet-Rich Plasma therapy to help restore hair. This proven method has shown to improve hair growth by as much as 30% in a published study. Platelet-Rich Plasma therapy uses the healing power of the patient’s own plasma to stimulate and maintain hair growth. 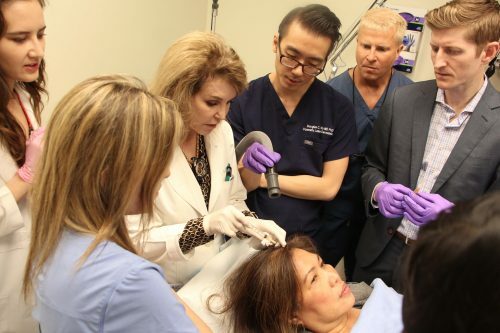 Since the patient is using his or her own plasma, the therapy tends to be more readily accepted by the body and infections and allergic reactions are rare, making it a well-tolerated and effective hair growth option. How does Platelet-Rich Plasma Work for Hair Loss? Platelet-rich plasma is full of nutrients and proteins that can improve hair density. PRP uses the nutritionally-dense layer of plasma to improve blood supply to the scalp, increase the thickness of the top layer of skin, and create a healthier environment that fosters hair growth. Research shows that platelet concentration is increased anywhere from 300% to 700% and then injected into the affected areas. What can patients expect when arriving for their treatment? PRP is a simple, three-step procedure. First, the doctor will draw a sample of your blood. Second, the sample is placed in a centrifuge for 10 minutes or so. The centrifuge separates the fluids in your blood into three layers. The most important layer is the platelet-rich plasma; after all, that’s what will be used for the therapy. The other two layers are platelet-poor plasma and red blood cells. In the third and final step, the doctor will clean and apply a local anesthetic to the treatment area. 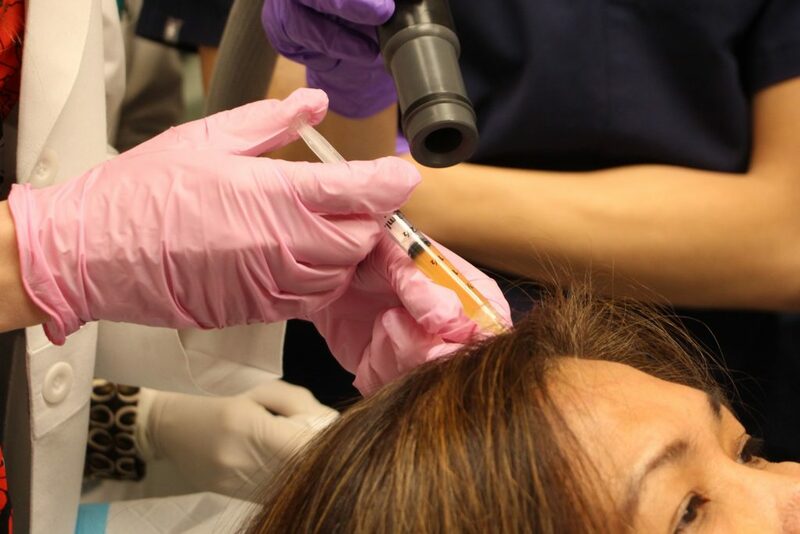 Then, one of our expert injectors will inject the platelet-rich plasma into the targeted areas of the scalp where there is hair loss or thinning. On average, patients generally receive five- to seven- milliliters of plasma per treatment. PRP therapy is often used to treat hair thinning and loss on the scalp and face. Since PRP therapy is a non-surgical, outpatient procedure, there’s limited downtime. You can typically resume normal activities right away; however, try to avoid vigorous exercise for at least 24 hours. As with any procedure, you may experience tenderness and swelling at the treatment site. You’ll receive aftercare instructions following therapy to help your recovery and maximize you results. Results depend on a variety of factors, including the severity and cause of the hair loss and thinning and other treatments you’re receiving. Typically, patients begin to see results just a few weeks following PRP therapy. However, it often takes at least six months to see noticeable growth. For best results, it’s recommended you receive four treatments carried out over a one-year period. 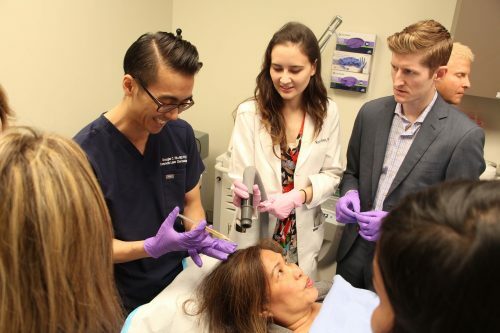 In addition to prp, we recommend patients follow up with Dr. Brook Brouha at our sister practice, West Dermatology, for additional prescription hair-growth options which will help achieve optimal results for hair growth. Q: What are the side effects of PRP therapy? A: PRP therapy is generally safe. As with any procedure, there may be side effects. These may include infection, scarring, and injury to blood vessels or nerves. During your initial consultation, the doctor will explain any potential side effects. Q: Is PRP therapy risky? A: Since PRP uses the patient’s own plasma, the risk of an allergic reaction is eliminated and the chances of infection are reduced as well. One’s own plasma is readily accepted by the body. A: PRP therapy is an option for many people who are experiencing hair loss and thinning. Please notify the doctor if you’re currently taking blood thinners, have a history of alcoholism or are a heavy smoker. Additionally, patients with the following conditions may wish to consider other treatment options: Cancer Acute or chronic infections Metabolic disorder Platelet dysfunction syndromes Low platelet count Thyroid disease Chronic skin disease Hemodynamic instability It’s important to report any medications you’re taking and conditions you’re receiving treatment for during your consultation to help the doctor assess if PRP therapy is right for you. Q: Does a PRP treatment hurt? A: Although PRP therapy doesn’t hurt per se, most patients may experience some discomfort during treatment. A topical anesthetic is applied beforehand to make the experience more comfortable. Typically, patients may feel stinging or burning in the treated area for five to fifteen minutes. Q: Does PRP last forever? A: Although PRP therapy effectively treats hair loss and thinning, you may have to receive treatment every six months or so to maintain your results. The doctor will discuss your therapy regimen during consultation. In addition to prp, we recommend patients follow up with Dr. Brook Brouha at our sister practice, West Dermatology, for additional prescription hair-growth options, like Rogaine, which will help achieve optimal results for hair growth.